Bold, bright flavors, how much do I love thee? Let me count the ways...Oh, wait. It isn’t time for Shakespeare. But it is time to express my adoration of the delicious, bright meals of last week! And boy, were they a beautiful bunch! Let’s get to the meals, shall we? More on this joy, later! When’s the last time you had great enchiladas? Like, really delicious, so good you can’t stop at seconds, really awesome enchiladas? Can’t recall? Yeah, me either! Until now. The chicken and tomatoes enchiladas from the new book Now and Again are what my now-enchilada-filled dreams are made of and I cannot wait to have them again. Sure, they were a bit labor intensive and Seth deemed them as a Friday or Sunday dinner option only, but that’s fine with me! Our Sunday dinner was spectacular. Now, we will keep it a little balanced because we also had a scrumptious kale salad with the enchiladas. We didn’t exactly need more food, but the salad did help keep us from eating the entire enchilada tray. Barely. The kale salad was fairly straightforward but with a wonderful twist: the dressing included toasted pumpkin seeds! 😮 Now, I’ve never had roasted pumpkin seeds thrown in the blender before with other dressing ingredients, but whoah, that is good. Add some sliced radish and a crumble of queso fresco on top and you’re in business! 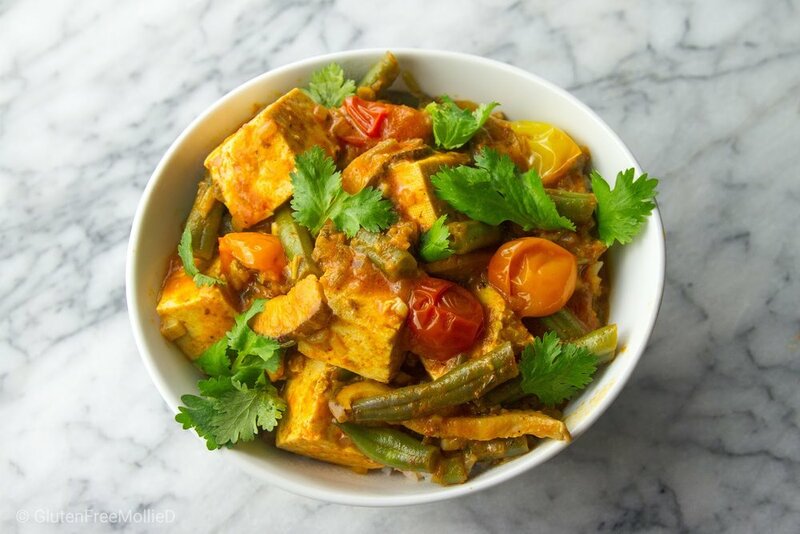 For those nights when you’re in the mood for meatless, may I suggest a tofu curry? Not just tofu, don’t worry. It’s tofu and veggies and red curry goodness. It came together all in one pot and created a bright, delicious meatless meal that was a fantastic option for a busy Monday. And while I usually request a mid-level heat for curry, I didn’t mind the somewhat mild nature of this one. Red Curry and Coconut Tofu with Tomatoes and Green Beans was a meal that thrives on its own, but could be convinced of adaptation. Yes, we left the recipe alone and really loved the result, but if it were up to me, the next time we make the dinner, I’ll swap out the tofu for chicken. I usually enjoy tofu in dishes like this one, but I prefer when the edges are crisped before tossing with the rest of the meal. For that reason, I think chicken may work better for this particular curry. However, to keep it meatless, stick with the tofu! Surprisingly, the veggies were my favorite element of the dinner! I’m as shocked as you. But hear me out: when veggies are cooked well and tossed/mixed with a scrumptious sauce (red curry), then you might find yourself saying the same thing. For a flavor blast, and a spike to your night, how about Garlicky Shrimp with Tequila and Lime?! Our Tuesday night dinner was light and easy, but boldly flavored and incredibly yummy. When you’re cooking with shrimp, it seems that the bigger the flavor, the better. This time around, the recipe called for garlic, butter, tequila, and lime. Can you say AWESOME any louder? Because that’s what will happen when you make these shrimp. You will eat them and think they’re AWESOME. Because they are. Since they’re just (awesome) shrimp, I wouldn’t say they’re enough of a meal, but easily a snack, appetizer, or full meal once added to a salad, which we decided to do. Not my entire idea, the author has these recipes in the same section, but it was my idea to top the salad with the shrimp, not just have them next to one another on a buffet (although that works, too!). The salad was a great mix of crunchy lettuces and cabbage plus a lot of lime, which was amazing in the same bite as a shrimp. Trust me! And since we were on a bit of a Latin kick from our enchiladas, we added sliced avocado to the whole thing. Sliced avocado really does enhance it all, and will be a permanent fixture on this plate next time we make the meal. We could’ve done guacamole, but I think basic avo slices were just enough. I didn’t want to compete with those awesome shrimp or very lime-y salad. On the nights I run after work (usually twice a week, sometimes three), I usually anticipate my extreme post-workout intense hunger (sometimes hanger) with a planned noodle/pasta feast. And while I think you’re supposed to have the pasta the night before your run, I’m choosing to look the other way and do what I want. And what I wanted was this incredible dinner: Wok-Charred Udon Noodles with Chicken and Bok Choy. A classic recipe from our beloved Myers and Chang, a restaurant we adore in Boston’s South End. His awesome skills cooking with the wok, which continue to improve, have allowed us to enjoy incredible meals like this at home which have forever spoiled us and the concept of “takeout Chinese” is pretty much gone. Why do takeout when you can have it fresh right in your own kitchen? This dinner was amazing, if you couldn’t already tell, and what I loved about it most was the comfort it created and flavors it welcomed. 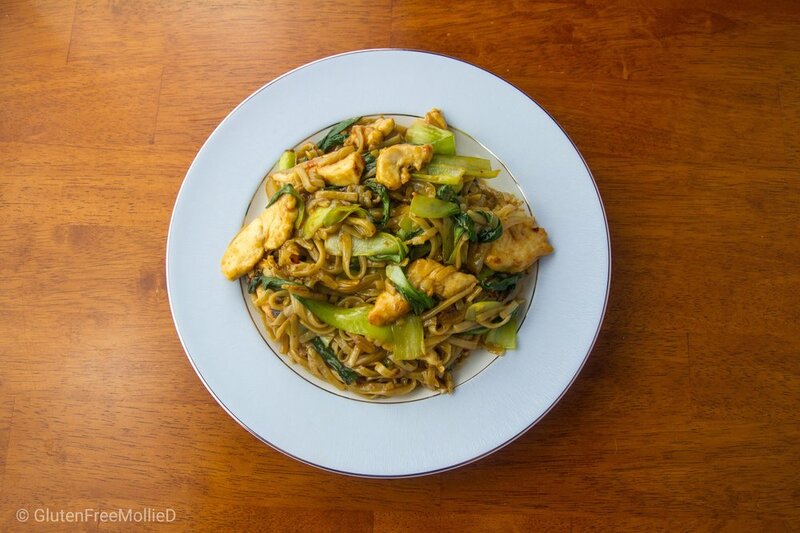 Hearty noodles with perfectly cooked chicken and bok choy (great veggie if you haven’t had it before!) all enveloped in a sauce that tastes, well, amazing. 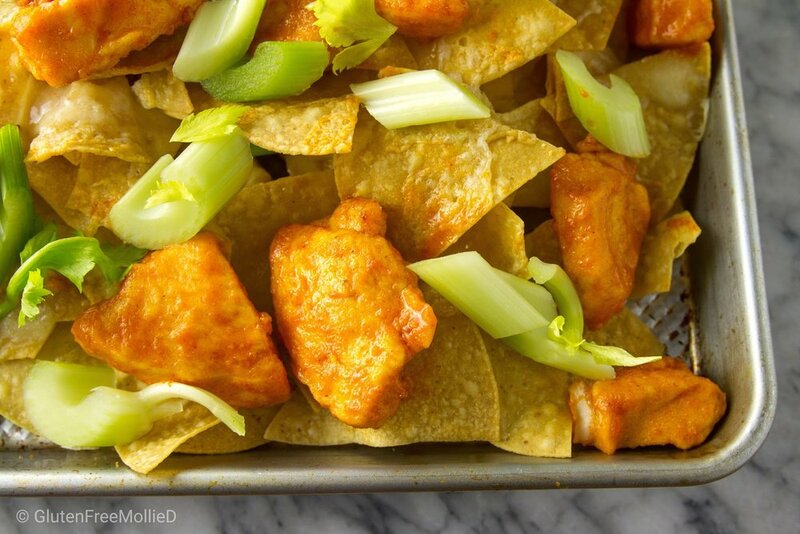 Whether you’re craving a takeout-style meal or just have a hankering for good ol’ chicken and veggies, this dish has got you covered. Not too spicy, salty, or sweet, and will leave you aching for seconds (I couldn’t resist), I found myself, once again, wishing for leftovers the next day. And of course, I had let Seth take them to work. Life is all about balance, as I’ve mentioned many times, and so to regroup from our noodlepalooza on Wednesday, we closed out our cooking week with a great fall salad on Thursday. And if I’ve learned anything from the many recipes we have made from What’s Gaby Cooking, she knows her salads. This Fall Cobb with Sweet Potatoes and Beets was no exception. It was splendid! A heartier salad due to being filled with roasted sweet potatoes, and chickpeas, this dish was (another) great meatless meal that proved itself fantastic without the addition of an animal protein. The variations on Cobb salad in this book are fun ways to experiment with the Cobb-concept without being a traditional Cobb salad. Some people just don’t like them! I do like the classic Cobb, but the variations we found in this book have been thoroughly enjoyed. 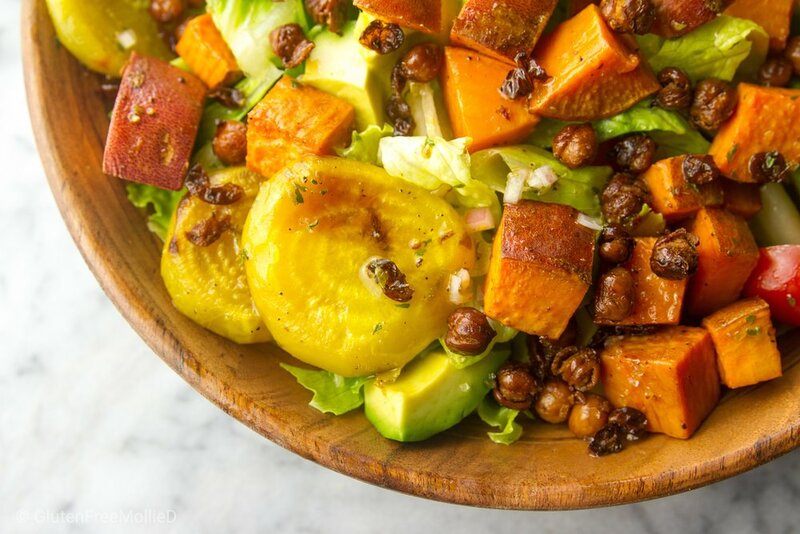 A great way to explain this fall Cobb would be this: many hearty ingredients (sweet potatoes, beets, avocado, chickpeas) on top of lettuce, with tomatoes. I suppose that sounds super basic, but we loved it! Sometimes you just need to chop up a few of your favorite foods, throw them in a bowl, and mix with a light dressing. Voilá! Easy, delicious dinner. Now, who can argue with that? Feel free to use your favorite beets in this one - we used golden - as I’m sure any variety would be excellent. Finally, we chose to fry our chickpeas (rather than just add them plain out of the jar) so that they provided a crunchy element to the salad almost like a crouton. PS: Fried chickpeas are heavenly. 😇 Welcome to your new favorite fall salad. What’s your favorite way to spend the first weekend of fall? Spending time outside, of course! Our weekend was a wonderful mix of dinners out, some errands, some baking, a spontaneous venture to the ocean, some football, and family. All of the “ingredients” to make a fall weekend pretty wonderful. Check out the highlights, and some photos, below! - Friday Night Dinner at Davio’s: love that this restaurant has a location close to us! Appreciate their vast GF menu, excellent wine list, and attentive staff that ensure my food will be prepared safely. Without fail, I always order pasta. Just can’t resist! - Saturday drive to Boston led to lunch at Burro Bar in Brookline: Amidst errands on Saturday, we landed in Brookline and popped into an old favorite that’s close to our previous neighborhood. Awesome brunch, great GF dishes, and a relaxed bar that we’ve enjoyed for years! Made me nostalgic for our years spent living in that area. - Spontaneous ride to Rockport, MA filled with beautiful views, and awesome dinner: Late on Saturday we decided to stop being lame (only doing errands) and drive east! A quick beach walk, a leisurely stroll among the shops, and an incredible dinner at a new restaurant (Feather and Wedge) to complete a really fun, relaxing few hours in the seaside town of Rockport. I can’t wait to go back! Evidence of a beach walk! My goodbye-summer salad with tomatoes, corn, and grilled halloumi (yum!). Perfect halibut over quinoa with tomatoes, radishes, and greens. Sunday was predominantly grocery shopping and meal planning, getting organized, and eventually watching football. Autumn in a nutshell, don’t you think? I take that back: we did go on a lovely (chilly) morning walk, too. Happy for the sunshine and colder air! What a relief. We hope you had a great weekend full of fresh air, great food, and are settling in to the new week! As always, thank you for reading! 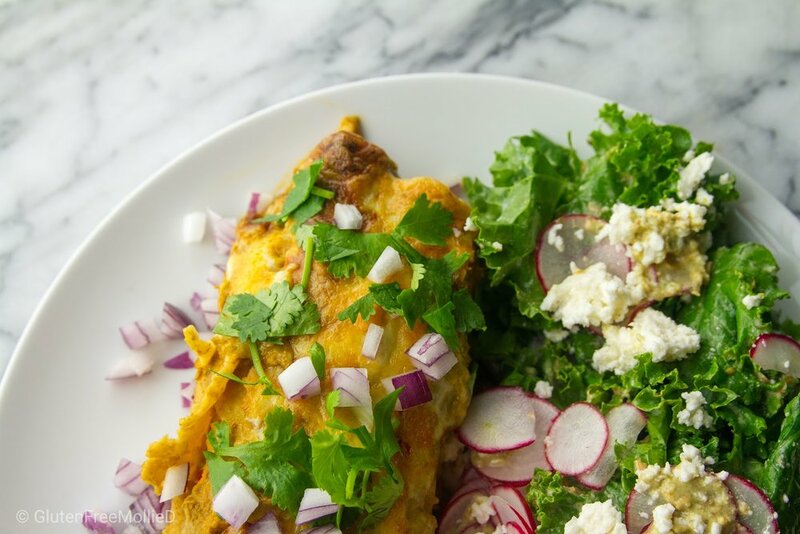 Chicken and Roasted Tomato Enchiladas, Kale Salad with Pepita Dressing: A naturally gluten free pair of recipes, just make sure the corn tortillas are labeled GF. Recipes available in the book Now and Again by Julia Turshen. 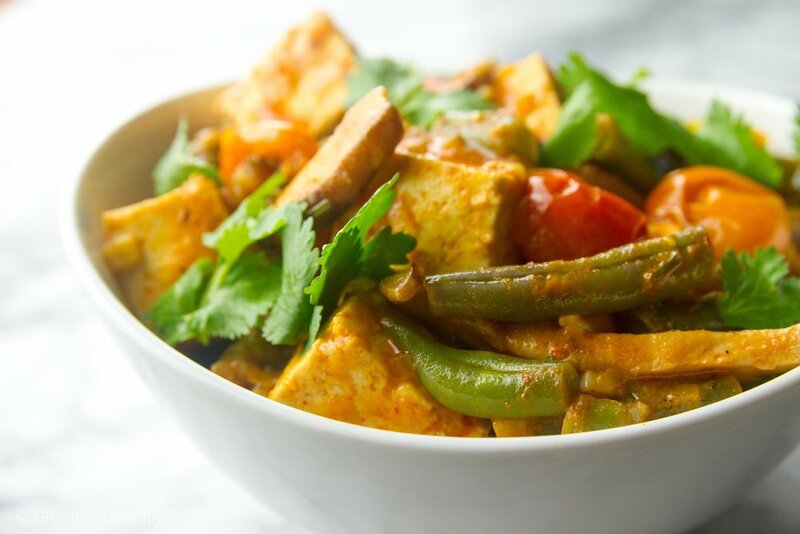 Red Curry and Coconut Tofu with Cherry Tomatoes and Green Beans: Naturally gluten free! Tofu is GF, but just make sure packaging is labeled properly. Recipe available in the book Dinner: Changing the Game by Melissa Clark. 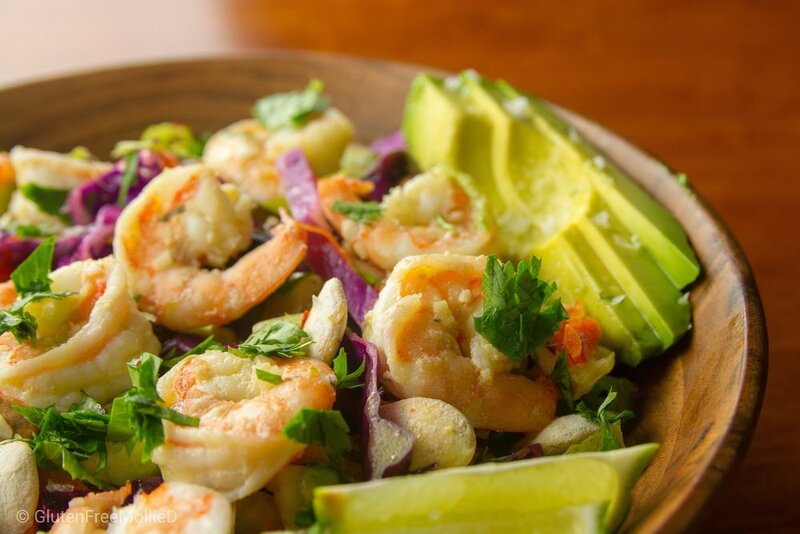 Garlicky Shrimp with Tequila and Lime, Super Crunchy Lime-y Salad: All gluten free! Another pair that need no modification whatsoever. Recipes available in the book Now and Again by Julia Turshen. Wok-Charred Udon Noodles with Chicken and Bok Choy: We used GF brown rice pad thai noodles instead of Udon which are made with wheat. Make sure to use GF soy sauce and that other sauces needed are labeled gluten free. Recipe available in the book Myers and Chang at Home by Joanne Chang and Karen Akunowicz. 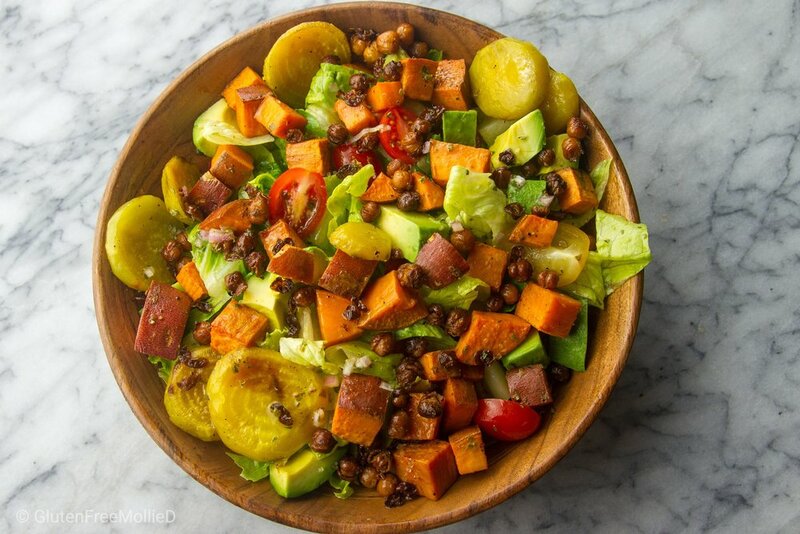 Fall Cobb with Sweet Potatoes and Beets: A naturally gluten free fall salad. We used golden beets primarily for preference, but feel free to use your favorite variety. Recipe available in the book What’s Gaby Cooking: Everyday California Food by Gaby Dalkin.